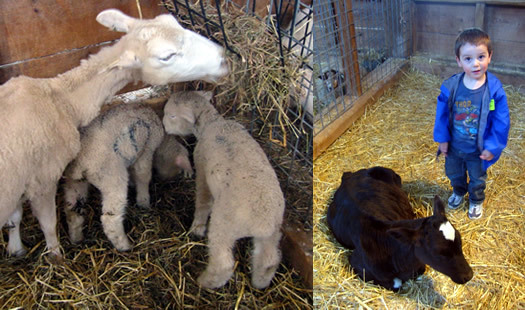 The baby animals are housed in the unique Round Stone Barn where you are invited to climb right into the pens and pet the wide variety of animals including calves, kids, lambs, and piglets. (Note of caution: Watch where you step... these babies aren't potty trained.) 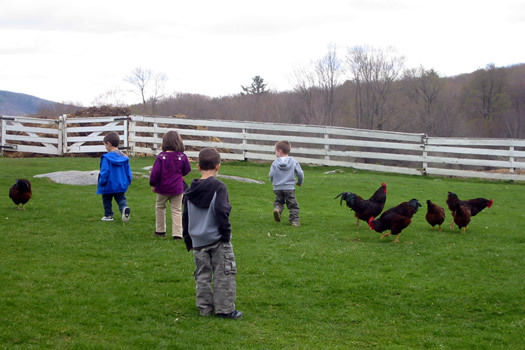 The children can also enjoy running around with the free-range chickens, turkeys, and ducks in the fields surrounding the barn. And don't worry about keeping your hands clean... there's a hand sanitizer dispenser around every corner. After wandering through the barn, you can head over to the Discovery Center where there is a whole other host of hands-on activities waiting for you and your family. Volunteer guides will walk you through weaving on a child-sized loom and spinning wool. You can also have a go at milking Mary Jane, a life size cow replica (water squirts out of her udders), donning some traditional Shaker fashions, and other arts and crafts. We must have spent another hour in here just looking around. There is also a schoolhouse (which we didn't get the chance to visit) where you can learn "how to behave like a good Shaker boy of girl." The grounds are expansive (20 acres) and perfect for picnicking, running around, hiking, and just enjoying the fresh country air and gardens. There is also a gift shop (a mandatory stop since you have to exit through there) and a small cafÃ© serving a wide variety of Shaker-inspired lunches, take-out picnics and ice cream. If you can manage it, the ideal time to visit the animals would be a weekday afternoon. We got there about 11:30 and missed all the school trips and midday nappers. According to the guides, the weekends can get pretty hectic, thereby limiting your petting opportunities. However, if that isn't possible, it would still be worth the visit. I already intend to go back again to check out all the things I missed this time around. Baby animals can be very distracting. Dawn is the author of Small-bany, a blog about stuff to do for kids and parents in the Capital Region. Enjoyed your article. Coming to visit Albany in May. Will have to put on my to see list! 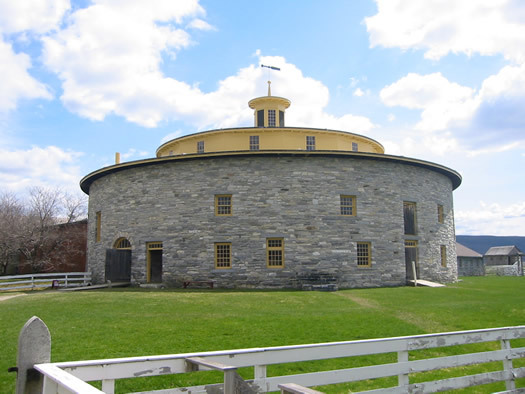 i visited the hancock shaker village when i was in grade school -- and we were not invited to crawl into any pens with cute baby animals. come to think of it, the only animals i even remember seeing while i was there were chickens. i guess thats the consequence of going with a group of 80 children (i get it). oh well. it looks like a great trip to take with a smaller group, tho. Adorable! But $17 for each adult to walk around a farm?!?! Not so friendly for the pockets. There is a lot more to do at the farm than just the animals, but in my mind I divided it by the three of us, ~6 bucks each, so that made me feel better. Speaking of animals, does anybody know where one can buy a tortoise besides the chain stores? I've done a lot of research on different tortoise breeds and their needs, and there is a specific kind that I think would be the best match for our house.. but Petco & Petsmart only offer the same two breeds (neither of which are the ones I'm interested in). I thought I heard somewhere about NY state laws regarding the selling of reptiles. Maybe the only two breeds available at the chains stores are the only two legal ones in the State for whatever reason? I dunno. Just curious if anyone has any feedback or can point me in the right direction. I don't recommend having wildlife as pets (tortoises are wild animals, not domestic pets). Yes there are quite a few restrictions on possessing wild animals in New York that are enforced by the Department of Environmental Conservation which does restrict what you will find in pet stores. Remember, just because they are in pet stores, does not mean they are pets. Many of those animals have been caught in the wild and shipped to stores. There is a group called the New York Turtle and Tortoise Society http://nytts.org/ that focuses largely on conservation of animals in the wild. You can get more information about them there. Baby animals are great and all, but the faceless chickens creep me out. 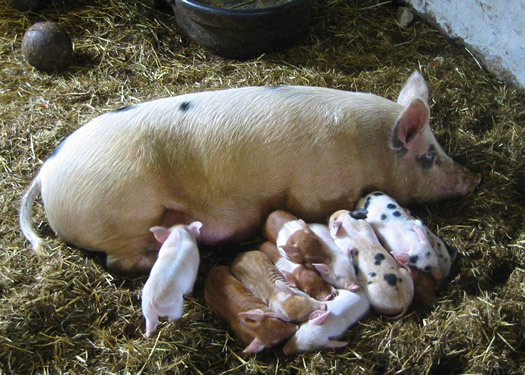 If you can't make it out to Hancock Shaker Village, there will be baby animals in Voorheesville at Indian Ladder Farms, May 8-23. Price is $5 per kid. See http://www.indianladderfarms.com/cgi-bin/ilf.cgi/blog/babyanimaldaze/index.html There's also a sandbox, a slide, and in past years, there have been pony rides (for an additional fee). My toddler daughter would be happy to spend all day in the sandbox.